With a signature shortbread cookie treat, Le Gourmet Baking brings its unique concept to a new Lovers Lane storefront. 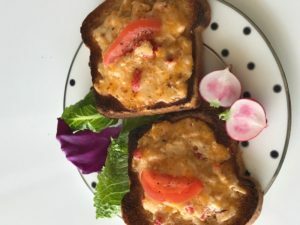 Le Gourmet offers fine casual catering, and take out includes soups, sandwiches, tartines and a la carte sides like their delicious 3-cheese pimento cheese (pictured at right), along with quiche and salads. Busy parents can also pick up lunch for their little ones. They offer two Kid’s Meals at this time. Founded in 2012 by Becky Nelson, Le Gourmet Valet began as a cottage industry meal delivery service in North West Dallas primarily to families in the Park Cities and Preston Hollow communities. Fast forward with hard work and grit, today finds Becky selling her special Le Gourmet shortbreads to Neiman Marcus, Royal Blue Grocery and an established base of individuals, organizations and companies for every kind of event or special occasion. The difference between her cookies and other decorated cookies is they taste as good as they look. Becky turned down the opportunity to become a cookie vendor with Trader Joe’s Texas stores; she was advised to go after her dream account, Neiman Marcus. Her gamble paid off, landing her shortbread a spot in Neiman’s The Christmas Book for 2016; as of now, they have six designs being sold year-round on NeimanMarcus.com. (Christmas, NM, Valentines, Easter, Citrus, Halloween — Ladybug will be added this spring). Visitors to the bakery are likely to find Becky greeting them at the front door and her talented team just behind the big glass wall separating the front of the shop from the newly outfitted dream commercial kitchen. Le Gourmet Baking is located in the Hakan International Building at 5601 W. Lovers Lane Suite 110 between the N. Dallas Tollway and Inwood Road. For more information call 469-399-7460.